Rapa Nui National Park and its stone sculptures are testimony to an isolated cultural evolution. Rapa Nui is the indigenous name of Easter Island. It's a volcanic island, with still two large craters: Rano Kau and Rano Raraku. The most characteristic cultural feature of Rapa Nui are the huge moai, found all over the island. These figures were created to represent the important ancestors of each clan. As time went by, their forms became more stylized and they increased in size. I spent 5 days on Easter Island - making a dream come true. Reading the books by Thor Heyerdahl as a child, I never imagined I would set foot on this remote island. But times have changed the last 15 years: travelling around the globe has become much easier and cheaper. As has to be expected, I didn't find a lost paradise here. It's quite an expensive destination, geared to the wealthy western traveller. But I had a fine time here. I walked, cycled and drove around the island. From ahu with or without moai to petroglyph to vulcano. Rapa Nui is an open air museum in the best sense of the word. The sight I probably liked best is Tongariki, the ahu with 15 moai in a row. Maybe that's because this was my reward after cycling 2,5 hours on Easter Island's roads that know no shade. Like many of the people I talked to there, getting to Easter Island and seeing its Moai was something I've wanted to do since I was a child. It totally lived up to my high expectations and I had a blast. The big question everyone asks when planning a trip: How long should you stay there. I stayed 3 nights. For me that was about perfect. I saw all the major sites and most of the lesser ones. 4 days would have been good if I'd had the time. (Keep in mind, I was *really* into it.) A week would have been too much. I was traveling solo, so that gave me the advantage to travel around pretty quickly, not having to coordinate schedules with anyone else. Here's a summary of what I was able to see and do. After landing, I got a quick drive through Hanga Roa by my airbnb host. I eventually rented a bicycle for the afternoon and visited my first moai, hitting close sites like Ahu Tahai. I rode the bike over the deeply rutted and eroded dirt road north to a couple of small lava tube caves, Ana Kakenga and Ana Te Pora, and a smaller ahu, Ahu Te Peu. It was a pretty nice day, but the wind was strong, which, combined with the horrible road, made riding pretty tough. While a bike was perfect for these spots, it isn't how I'd choose to tour the rest of the island. The main paved roads are in good shape, but I saw some other visitors riding in the wind and rain and it just didn't look fun. If I had to do it over again, I would have been more organized, and perhaps pre-arranged for some guided tour on my first afternoon there. On my first full day, I joined a group guided tour (booked the day before). I would really recommend this as my guide was very informative and offered great insights into the history and culture of the island. The next day, I rented a car and visited the sites that the tour did not cover, and also returned to a couple of the sites we had hit because it was raining when our tour visited them and I wanted a longer, drier look. I kept the car for part of the fourth day, since I had lots of time to do more touring before my plane in the afternoon. Rano Raraku: This volcano is the quarry whence the moai were cut out. Definitely my favorite place on the island, and really fabulous to see them in various states of construction. (Visited on tour and on my own.) The "route of the moai" also starts here and I walked along it for a little ways. This is the route the moai were transported along, and there are several moai along the route which were abandoned where they tipped over during the process. Ahu Tongariki: With 15, it's the largest set of moai standing. It's definitely a can't miss. There are also some petroglyphs here. 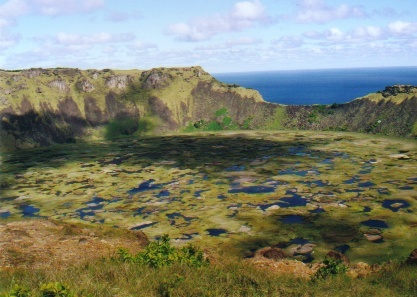 Orongo: The site of the bird man cult village, along with the overlook into the crater of Rano Kau, now a nature preserve off-limits to tourists. Orongo was great and I met one of the rangers there with whom I arranged a private tour later that day to Ana Te Pahu. Ana Te Pahu: This is a really large lava tube cave. The ones I'd visited by bike on day 1 were comparatively small. This one went for hundreds of meters, was much bigger around (inside), and you had to wade through water much of the time. It was really cool to visit it, and I wouldn't have been brave enough to explore it without a guide, just for not knowing what I was getting into. Most tourists don't get here, which also made it fun to visit. Evening cultural show: Not really part of the UNESCO site, I guess, but I attended the Kari Kari Cultural Ballet. The dinner was actually pretty good and a fair value, and the dance and music show was really great. I almost didn't go because I'd seen similar dance shows in French Polynesia. But in the end, I was really glad I attended. Ahu along the southeast coast: Most of these were on my guided tour: Vinapu with it's "Inca-fit" stones, Vaihu, and the toppled moai of Akahanga, and a natural blowhole along the coast. Interior ahu: Including such as Ahu Huri a Urenga with its double hands and evidence of being an astronomical observatory, and Ahu Akivi with the moai that are uniquely facing toward the ocean. Puna Pau: The quarry where the red top-knot stones were cut. Ana Kai Tangata: a coastal cave near Hanga Roa airport that really wasn't that impressive to me. Its Bird Man Cult era best colorful drawings are nearly gone. Some of the other reviews here made it sound like the island is being overtaken by giant hotels. It didn't give that impression to me. Much of the lodging is still in airbnb kinds of places. There are no mega high-rise resorts, but the hotels there are fairly expensive. It seemed a decent balance. I found a couple of okay places to eat for a reasonable price, as well as trying out some higher priced tourist places and it was all good. When I was not with a group tour, with the exception of the Big 3 (Ranu Raraku, Anakena, Tongariki), or places right in Hanga Roa (Tahai), for the most part I had each place to myself, and even Anakena and Tongariki were not busy unless a group was there. I visited in November, which probably isn't peak season, but was a pretty good time to visit. It didn't feel overrun with tourists. To me, it is one of the most interesting UNESCO sites in the world. I visited Rapa Nui in 2007. The moai of Easter Island are some of the most famous and iconic sculptures on Earth. In the ten years since I visited I have been told tourism has increased dramatically. There were no proper hotels on the island when I visited. Now there are several. There are still only two ways to get to the island: fly from Santiago, Chile, or fly from Tahiti. There are a small number of cruise ships which stop each year, but given its remote location, few bother to make the voyage. 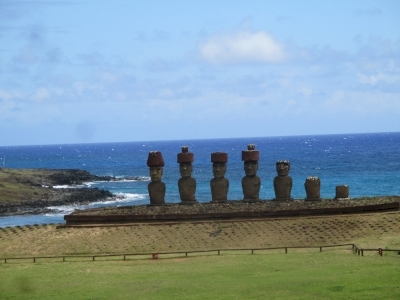 Read more about Rapa Nui on my website. Oh, the costs. And the time. And the detour. And haven’t I already seen all there is via documentaries and photos? … These were my thoughts when I planned my trip to Chile and had to make up my mind if I wanted to go to the Easter Island. But I kept looking at the whs map and this spot in the middle of the Pacific Ocean just kept on smiling at me. With some additional nudging from our community in the forum (thanks Els! ), I went ahead and booked the flights. And, boy, am I glad I did, because without a doubt this is one of the great sites of mankind. It’s not just the Moai that seem to be fallen out of time. The Moais are embedded into stunning scenery that I got to take in mostly by myself. So, if you happen to be in Santiago, hop on a plane and go. Arrival afternoon: Hike to Orongo. 1 Day – Small circle: Hike / Cycle North of Hanga Roa to Ahu Tepeu and then hike up Maunga Terevaka. 1 Day – Big circle: Tour / Rental Car / Cycle to the East part of the island, Anakena, Ahu Tongariki and Rano Raraku. But this itinerary hinges on the weather being okay. In my case the very second I came back from the big circle on my last day on the island, all hell broke loose rainwise. Obviously, you can stay longer to enjoy the scenery, the beach, do some other hikes or go diving. But as much as I was enthralled by the island, I was wondering what I would have done had I stayed a full week, let alone lived there. It seems going over the weekend is more expensive than during the week. Also, the afternoon flight back to Santiago may be more expensive than the midnight, red eyes included one. I think cycling and hiking are the best way to experience the island. It’s not that big and you get to take in more of the nature this way. However, be warned that the big circle is really big (45km), contains several steep climbs and the wind is constant. Personally, I wouldn’t have done this by bicycle and was already about to book a tour. But then I found a place near the harbor that rented ebikes (easybici.cl) for 20-25k Pesos and that was a perfect solution for me. Food is pricey compared to the mainland. I paid around 40€ to 50€ for dinner. And the quality was rather varied. Te Moanu near the harbor comes highly recommended and has a nice view. Kanahau does not: The quality was not in line with the price. If you take the midnight flight back, you can head to Valparaiso in the morning and then catch the next flight out of Santiago in the evening. I wish I would have, instead I stayed another night in Santiago which I found rather dull. The default sunset picture can be taken at Ahu Tahai. You will have plenty of company. You need to buy a park ticket which is valid for 5 days. Pick it up when you arrive. You need 30k Pesos or 60 USD in cash. Pesos was cheaper. There are very few shops or cafes on the island as soon as you leave Hanga Rau. So pack everything you need before you head out of town. The limited travel options to the island imply that there are rarely more than 2.000 tourists on the island (4 planes * 500 people in/out per day) and you have great parts often to yourself. However, it also means that the tourist infrastructure is not very mature. E.g. no Irish Pub. Internet is terrible, probably because the connection is made via satellite. Many guest houses and restaurants don’t even offer it. If you get a SIM in Chile, pick Entel as they offer coverage on the island. Movistar may, too. You can get a stamp for your passport at the post office while you buy stamps for those very exotic postcards (600). I have just returned from Rapanui..what an awesome experience. Their second language is Spanish. My command of the Spanish language is minimal to zero, however, I spoke Maori to the locals at the church and they were so excited as they could understand me. I said "Kia ora" One elder replied, "He Maori keo no Aotearoa?" I said "ae" I said Kei hea ta kotou Museum? the elder said "Haere koe i runga i te ara...ka huri pera, 'Indicating with his hand. "a ka Huri pera" On his instructions I found their museum. It is an unfortunate fact that long-anticipated visits to “iconic” WHS can often disappoint, but ours to Rapa Nui (Easter Island) most certainly did not! This, despite the fact that we had but a mere 7 hours ashore during a trans-Pacific cruise which took us on the “Heyerdal” sea route from the Peruvian coast taking 5 days on our cruise ship and then onward into “Polynesia proper”. 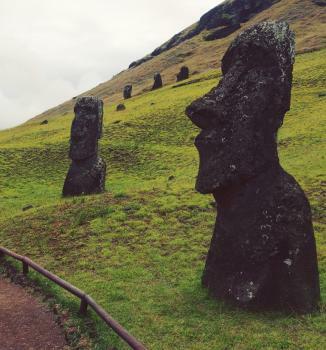 However you get there, Easter Island is an expensive and logistically awkward destination – most visitors will either fly through Papeete or do Santiago return. It certainly justifies more than the short day we gave it, but we were able to take in the main sites with reasonable free time. It would of course have been nice to return at different times of day for optimal photographic conditions and to have explored the less famous locations. On arrival you have the choice of minibus tours, private taxi, rent-a-car, bicycle or walking. We took the former in the morning and then a taxi in the afternoon. As regards walking and bicycle – well, it may look a mere “speck” on the World map, but it is a bit bigger “on the ground”! The main “town” of Hanga Roa is actually a very spread out village now full of restaurants, guest houses and the accoutrements of a tourist centre – just walking around it from your guest house could take a while but there are nearby walkable sites which could be very pleasant to reach along cliff paths. The other main sites are across the island and you would need to be prepared for a reasonable all day cycle ride to reach them. a. Ahu Tahai. Walkable just north of Hanga Roa so no problem to take in. It actually covers 3 different Ahu and Tahai is in the middle with its “restored” coral eyes. c. Rano Raraku. The quarry from which the moai were cut. A number remain still only half-formed in the living rock but all around are part buried (from forehead to waist) and toppled examples of fully formed ones at all sorts of angles to the ground, looking as enigmatic as you always expected them to be! If you were to cycle out from Hanga Roa you would have to be prepared to cover at least the 18kms to here – but the road follows the coast and you would pass 10 or more Ahu in various states of destruction some of which at least which would be interesting to stop at and explore (in our tour mini-bus we were unable to!) including examples of face-down and face-up topplings (a potentially historically significant difference apparently!). The site also provides fine distant views of Tongariku a bit further on. You will have to show (or obtain if you haven’t already done so) your National Park ticket (US $60 pp) here in order to get in. d. Orongo. A ceremonial “village” used by the Bird-man cult of 18th and 19th Centuries which, at least partly, superseded the older moai cult. 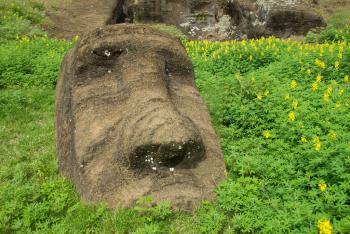 It is situated around 3kms SW of Hanga Roa along a dirt road – a foot path following the cliffs looked more interesting. The site is stunningly situated on a rocky promentary, high above the sea with a spectacular deep circular volcanic caldera on the other side. A series of dry stone constructed cult houses leads to a “high place” of rocks covered with “birdmen” petroglyphs. Far below lie the islands which the birdmen had to reach to collect the Sooty Tern egg before returning to the cliff top with it! WMF have just constructed a small visitor centre and exhibit here and again you will need a ticket to enter. Another “do not miss” site in my view. It might have been nice to visit Anakena with its group of restored moai. 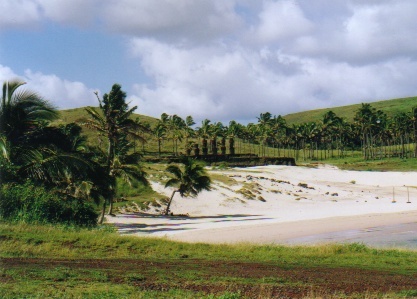 It lies beyond Tongariki and also has a beach – but we are not “beach people” and made the decision (rightly I think) that we didn’t really “need” more moai but that Orongo was absolutely “necessary” to provide a rounded picture of Easter Island culture. I visited Easter Island in April 2009 and although several of the previous writers have decried the "development for rich American tourists" (actually I heard more Spanish, understandable, and Italian) the island is still relatively undeveloped and not the golf course self contained hotel disasters one sees elsewhere. In fact the only town is Honga Roa and it retains a somewhat down at the heels but charming quality. Sure there are T-shirt shops but there are grocery stores and hardware shops too. Don't expect beautiful beaches and lush landscapes either but there are those statues. 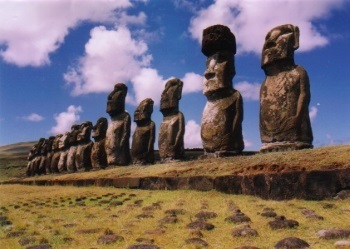 The chief attraction are the statues or moai. I found the sites where the moai have not been re-erected to be the most interesting as one can get a better sense of the past and paradoxically what they might have looked like when standing. There is a haunting sadness to the site of a toppled, broken moai that affected me more than the standing statues, those those are certainly dramatic and not to be dismissed. Getting around requires either a tour, a four wheel drive (many of the roads are not just unpaved but little better than dirt paths) or a car with driver though I did see lots of bikes. Prices were not exorbitant. Four days at a minimum are necessary to really get a sense of the island and there are many interesting hikes and some caving. I spent one day hiking the northern coast (about six hours) where there are no roads but some of the most spectacular sites. Getting lost is impossible--keep the ocean on your left. Most of the literature talks about "the collapse" or the ecological disaster leading to civil war but much of that is under dispute, so go with a skeptical approach to most of the theories. The museum is small but provides a good foundation for the visit. I think that Easter Island is about the most intriguing place on earth. I lived on Oahu for 3 years, and the only thing that disappointed me was how it catered to American life. I would change my life in a second to live in a place that people know that money doesn't bring happiness. That you could enjoy every day you're alive because you are with your friends and family, living in the best place on earth. Okay, so I didn't really read your site. But I didn't actually have to, I mean my dad is from Easter Island (believe it or not). So as you can probably guess I have pretty strong ways of juding someone who talks about the Island. I in no means am trying to be mean, but put yourself in my shoes. I've visited there only twice, but have had Rapa Nui in my blood all my life. You all can go to visit,and judge it the way you would like, but by all means you really have no idea what life is really like for these people. My Grandma had 17 children, most of which still remain at home on the island. I have seen so much life through these people's eyes, and they get so much pride out of so little. So when you visit and say that it seems kind of expensive, look at how the people actually live. In shacks! If this was your only way of making money was toursits, then you would do it. So before you judge these people imagine picking corn, running a bussines for very few people, or raising horses just to feed your family. You wouldn't make it one day, while these people have made it a lifetime. So don't judge, look deep in the souls of the people there. In all honesty they can teach us Americans a way of life we would never want to live or could live. But you know what, they are the most happiest people alive, beause in there eyes they are rich because they have family, friends, and all the essential's of life. So take time to get to know the Island before you judge it, because believe it or not it can teach you a life lesson, even if you just speak English. Oh yeah believe it or not my Uncle is the Mayor of the Island Julio Araki. Look up the Araki's if you ever visit they will treat you just like family, they are mine! I spent 2 weeks in Rapa Nui last year. the plan was to bring a tent and sleepingbag, to keep the costs down on accommodation, but amazingly it turned out cheeper to rent a room in a lady's house than to pitch my tent up on one of the camingsites. The island is truly beautiful. The atmosphere and the hospitality amazing. The family I stayed with did their very best to look after me, show me their island and include me in their everyday activities. I couldn't have wished for anything better. Now, the only thing that spoiled this little paradise, was the way it has been exploited to the American tourists. There is this massive hotel which has been built, where the prices are sky-high of course, and designed to cater for the "rich and comfortable". It is such a shame. Thelocals, of course, are happy for the money they can make, but it makes you wonder what the travelagents who exploit places like this think of?! The whole charm, the exotic feeling this island gives you will disappear if they try and change Rapa Nui to yet another tourist-trap. None the less, I will definetely return to this little paradise. Just as much for the amazing scenery and magic nature as for the kind people and their culture. 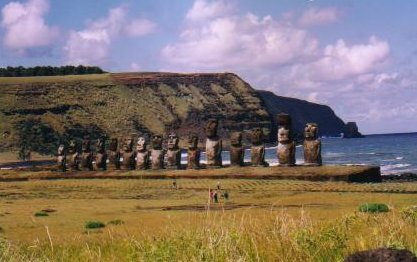 Hit by Tsunami: Apparently Easter Island was hit by the same Tsunami that damged Chiloe. "Although Tongariki's moais were toppled in the chaotic end of that era, most of the damage to altars, the ahu , came later. Cristino said cut stones from the altar were removed in the late 19th Century to make fences for the sheep ranch that had taken over the island. 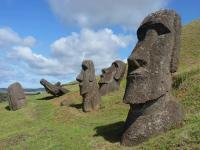 In 1960, a tsunami swept over the site, scattering moais and ahu stonework over an area of eight acres." Historical Food Remains: Palm nuts and animal bones were found in caves on the island. Secret Locations: Several cave dwellings were found on the island. They were hidden by rock walls and were probably used as shelters during war times.